My beautiful brassica seedlings were eaten by caterpillars, despite being under insect mesh and using diatomaceous earth spray. Instead of cabbages, cauliflowers and broccoli I now have nearly three meters square of mesclun. I’d mulched up some lettuces that had gone to seed with some other branches and prunings. 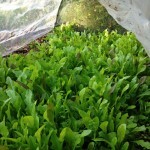 The resulting mulch I used around the seedlings was full of lettuce seeds and found the perfect conditions, protected from wind, sun and rabbits by the insect mesh. 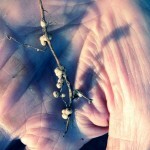 I’ve just pulled out some ‘yard long bean’ plants. Nary a bean in sight but the roots were loaded with nitrogenous nodules so will be feeding the leek seedlings I’ve planted in the same spot. We take our recycling to the depot so our recycling bin has made an excellent home for some ‘topweight’ carrots. Filled with home made compost, topped with a layer of potting mix to suppress the weeds, the seedlings have germinated really well and haven’t been bothered by slugs or snails. 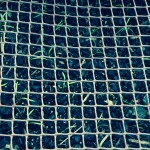 I could tie the mesh onto the handles to keep the birds from scratching for worms.